After the success of my first pair of Gingers I was keen to make another pair in a nicer fabric and to try a different leg cut. 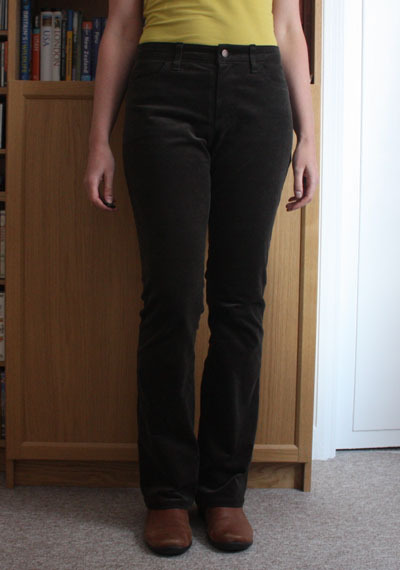 I’d brought this stretch needlecord from Minerva Crafts in olive green a while back, but always with the intention of making this pair of trousers. It is lovely and soft and I really like the colour for a versatile pair of trousers (although of course it is difficult to get a dark colour to photograph well!). Working with cord does need a bit of extra consideration – I ensured all pieces were cut with the pile running in the same direction and used a towel when pressing to avoid flattening the cord. I wear bootcut jeans a lot as I find them both comfortable and flattering and thought I’d get more wear out of these with such a leg style. 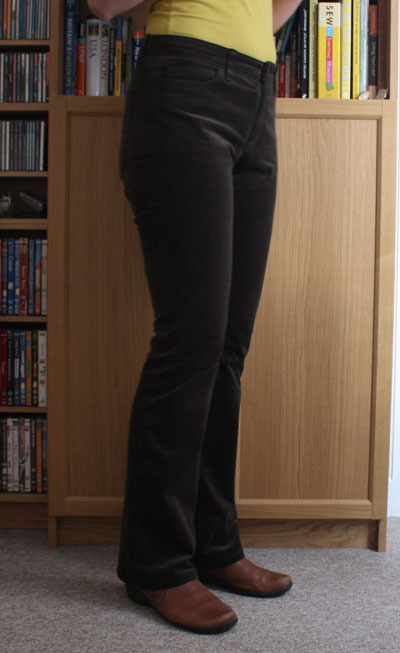 To adapt the pattern, I followed the instructions in the Closet Case Patterns jeans ebook for modifying your pattern to flares, but didn’t flare out so much at the hem. Prior to that modification I did make a few adjustments to the pattern to get a better fit from my first pair – lengthened the legs 3cm at the knee, added 1cm to hip side seams and I also moved the inseam backwards by 1cm as I felt it was sitting too far forward on my first pair. I also made quite a few adjustments while sewing. Since the cord was stretchier than the denim used in my first pair and I was making a significant change to the leg shape, I baste fitted the legs twice (first to check the inseam, then again before sewing up the side seams to check overall fit). 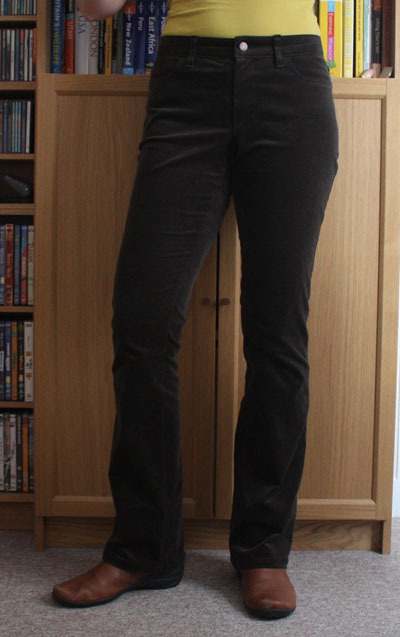 I took the jeans in at the knee as I felt the style looked better with a more fitted thigh. For top stitching I used 2 strands of regular thread in a matching shade and think this looks pretty good on these trousers. I flat felled all the seams that I could, takes longer but is totally worth it for the neat and strong finish it produces! The only “mistake” with these jeans is the waistband – as with my first pair I didn’t cut this out until checking the fit and sewing up the side seams. 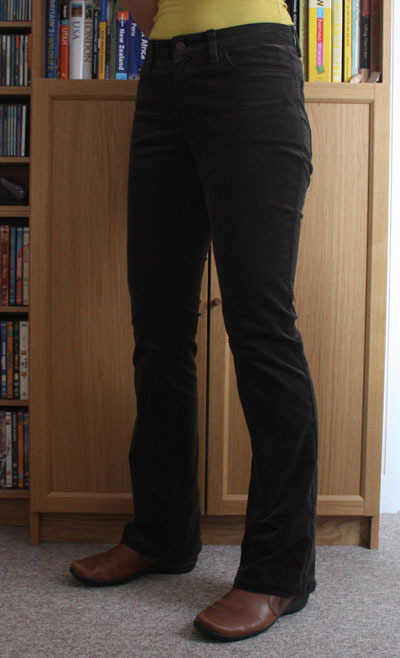 With the stretchier fabric, this meant a shorter/slimmer waistband than my first pair, which would have been fine except I also interfaced it as the waistband seemed to stretch out a bit too much on my first pair. Sadly the combination of a slimmer waistband plus the interfacing (which stops it having any give) means it can get a little uncomfortable after a big meal hence I have to put a bit of thought into whether they are going to be appropriate for my day!